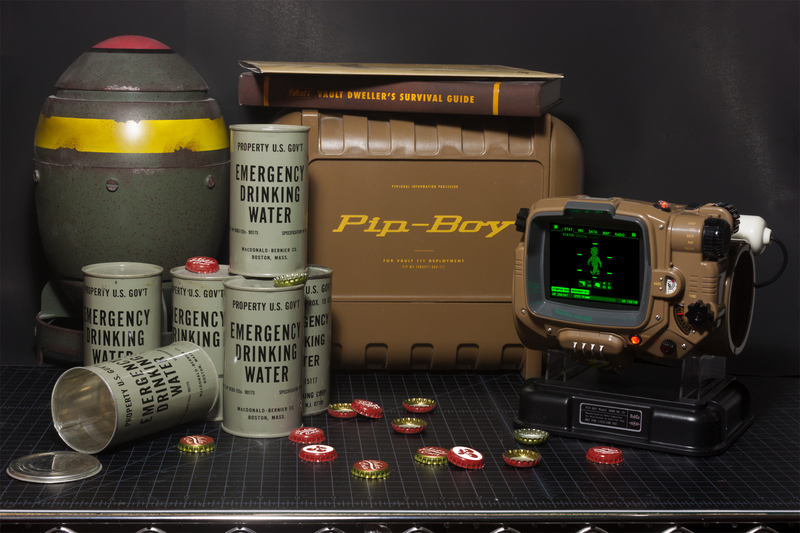 Fallout 4 — Pip-Boy Edition, Vault-Tec crate. Vintage Cold War era ‘EMERGENCY DRINKING WATER’, the basis for Fallout 4’s ‘Purified Water‘ in-game item. The water was canned under government contract in the ’50s, I opened one so I could use the can for things— and yes, I took a sip…because otherwise what’s the point? —they were canned September 15th, 1953. The bottle caps are actually photoshopped. The caps were really there, but were blank, I added the artwork I plan to use for decals/silkscreening the real caps later.